By default, the Beaver Builder editor is enabled only for Pages, as shown in the following screenshot. If you select Posts, you can use Beaver Builder to design the content area of single Posts. If you have WooCommerce installed, select Products to lay out single product page content in Beaver Builder. If you have custom post types, select them to enable the use of Beaver Builder to lay out the content area of singe custom posts. 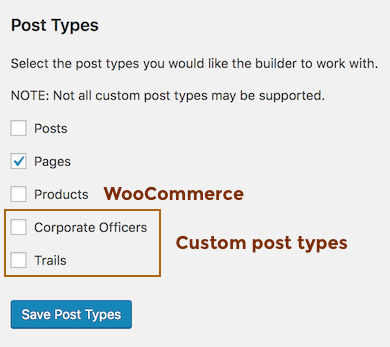 For Posts and all custom post types including WooCommerce products, selecting these choices lets you use Beaver Builder to lay out just the content area of the post types you select. If you want to use the same layout for more than one single post, save the layout from one page as a template, then add that template to each new post you create. See the Related Articles for more information. These post-type settings apply only to regular Beaver Builder layouts in the content area of the page, not Beaver Themer layouts, which apply outside the content area. The two are mutually exclusive, in that if a Singular-type Themer layout applies to a post or page, you can't use Beaver Builder to lay out the content area, and vice versa. For more information, see the primer about the content area versus other parts of the page.